Publication History: This article is based on Chapter 3 of "The Log Analysis Handbook" by E. R. Crain, P.Eng., published by Pennwell Books 1986 Republished as "Crain's Logging Tool Theory" in 2004 and updated annually through 2016. Updated Dec 2018. This webpage version is the copyrighted intellectual property of the author. 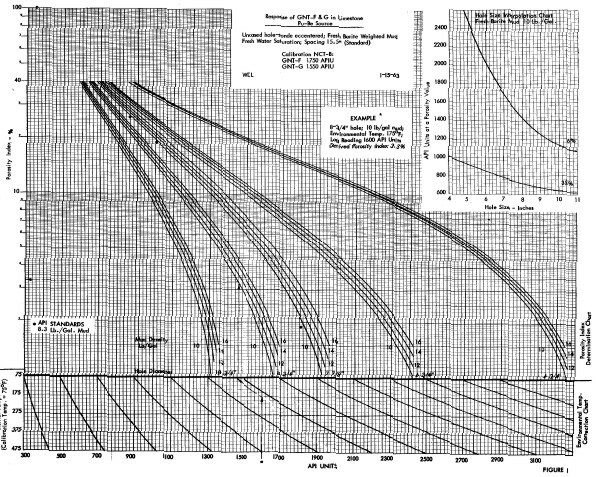 The first commercial neutron logs were run in 1945 by Lane Wells. They are based on particle physics concepts. Neutron logs emit fast neutrons from a source at the bottom of the tool. The effect of interactions with the rocks and fluids on the neutron flux is measured by detectors above the source on the logging tool. Hydrogen has by far the largest impact, so the tool can be calibrated to represent hydrogen index, which is highly correlated with porosity. 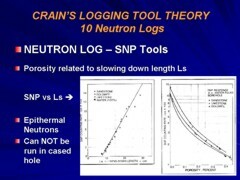 So neutron logs are considered to be porosity indicating tools. There are three basic neutron logging instruments with a chemical neutron source. Each instrument is classified according to the energy level of the detected particles. Fast neutrons have energies greater than 100 KeV; epithermal neutrons have energies above 0.025 eV up to 100 KeV; thermal neutrons have an energy of approximately 0.025 eV (at 25 C). The three tool types are generically called neutron - gamma, neutron - epithermal neutron, and neutron - neutron devices. The first is represented by the original neutron log that emitted fast neutrons and measured gamma rays of capture emitted by the nuclei of the rocks when a neutron was captured. They were called neutron-gamma or gamma ray neutron logs. The latter was widely used as a descriptive term but was confusing as it suggested that a gamma ray log was also being run with the neutron log. While both logs were often run together, the description of how the neutron log response was measured got lost in the process. The second type emitted fast neutrons and measured the number of epithermal neutrons as they lost energy after colliding with atoms in the formation. These are represented by the sidewall neutron log (SNP) tools. The third type uses detectors sensitive to thermal neutrons. These have dual detectors that allow for some borehole compensation, represented by compensated neutron logging tools (CNL). A fourth type uses an accelerator source instead of a chemical source of neutrons. It measures both thermal and epithermal neutrons. The tools are more delicate and more expensive but are safer and reduce paperwork if the tool is lost downhole. GRN and CNL log types can be run in air, oil, or mud filled open or cased holes. SNP logs were not calibrated for use in cased holes. In older tools run from 1945 into the mid 1960's, fast thermal neutrons are sent out, which are captured by hydrogen atoms. Gamma rays of capture are emitted to balance the energy. The number of gamma rays returning to the detector is inversely proportional to the number of hydrogen atoms, which is highly related to the porosity of the rock. These logs record the gamma ray count rates in counts per second. Conversion to hydrogen index or porosity was made by using a semi-logarithmic transform. This tool is obsolete. The logging tool produced a single curve in counts per second or API neutron units. It was often run with a gamma ray log, so the GR curve in ug-Ra equivalent/ton or API gamma ray units would be presented in Track 1. The emitted neutrons come from a radium – beryllium or an americium – beryllium source. Radium and americium are natural alpha particle emitters and the alphas eject fast neutrons from the beryllium. With its 433 years half life, the AmBe source output is considered very stable. Approximately 40 x 10^7 neutrons/sec at 4.5 MeV average energy are emitted by the source. When the neutrons are sufficiently slowed down by collisions with the formation, they are captured by the nuclei and a high energy gamma ray of capture is emitted. The gamma ray count rate at the detector is inversely proportional to the hydrogen content of the formation, in a semi-logarithmic relationship. Borehole size and mud weight corrections and calibration to porosity was done by the log analyst. Detectors were Geiger-Mueller gamma ray counters. A second type of logging system responds primarily to epithermal neutrons and is referred to as a neutron-epithermal (N-EN) log or a Sidewall Epithermal Neutron Log (SNP). The neutron detector counts the slow epithermal neutron density, which is largely determined by the amount of intervening hydrogen between the source and detector. The detector is a lithium iodide crystal with suitable shielding to eliminate thermal neutrons. This tool had a short lifespan from the mid 1960's to the early 1970's and was replaced by the CNL. The source and detector are on a skid identical to the density logging tool. The skid is pressed against the borehole walls, eliminating most borehole and mudcake effects, except for very rugose hole conditions. Detector count rates from the SNP systems are converted by a computer in the logging truck to porosity units, on a sandstone, limestone, or dolomite scale, depending on the assumed or known mineralogy of the formation. There is little borehole effect because the tool is a sidewall pad device similar to the density log skid. However, it sees a relatively small volume of rock, and has been generally superseded by the compensated neutron log (CNL). The usual log presentation is a single porosity curve, with GR in Track1, and possibly the epithermal neutron count rate. The most commonly run neutron log today is the compensated neutron log. It is an eccentered dual detector log that can be run in both open and cased boreholes. This log measures the rate of decrease of neutron density with distance from a source and converts it to a calibrated apparent porosity value. The rate of decrease, represented by the ratio of the near to far count rates, is primarily due to the hydrogen content of the formation. Most CNL tools are neutron – thermal neutron (N – N) tools but some have additional detectors for epithermal neutrons (N – EN) measurements. Helium-3 detectors are used in the small diameter CNL instrument whereas the large diameter instrument utilizes lithium iodide crystals. Variations from standard borehole conditions are compensated by means of the dual detector system. The corrected apparent porosity values are derived from the count rate ratio of near and far spaced detectors by a computer program. Additional environmental corrections may be required in hot, high salinity boreholes. The program also compensates for casing and cement thickness in cased hole situations. The count rates from the two detectors can be displayed and are often used as gas detection indicators. In clays, micas, and zeolites, the apparent CNL (thermal) porosity is consistently higher than the SNP (or CNL epithermal) porosity. As a result, the CNL thermal measurement shows higher porosities in shales than the SNP tool. The explanation for this effect is that the SNP tool responds only to the slowing down of the neutrons by hydrogen atoms, whereas the CNL measurement is also affected by the neutron capture process, since the tool measures both thermal and epithermal neutrons. The log produces from 1 to 3 porosity curves based on different lithology assumptions and the two count rate curves. It is usually combined with the gamma ray, 1 or 2 caliper curves and either or both the density and density porosity. A fourth style of neutron log uses a particle accelerator to create the fast neutrons, instead of a chemical source. The accelerator forces deuterium and tritium collisions at high energy levels to produce the neutrons. This tool is derived from the concept of the pulsed neutron (thermal decay time) tool widely used in cased hole logging to measure reservoir properties. It produces an epithermal neutron log. The tool is called the accelerator porosity sonde (APS) by Schlumberger. When combined with a litho-density and spectral gamma ray logs, they call it an integrated porosity log (IPL). Integrated porosity lithology service delivers accurate formation porosity and lithology information by acquiring neutron porosity, natural gamma ray spectrometry, density, and photoelectric effect measurements using one modular tool. The accelerator porosity sonde, which uses an electronic pulsed neutron source instead of a chemical source, is the core of the tool. The large yield of the neutron source enables epithermal neutron detection, which in combination with borehole shielding obtains porosity measurements that are only minimally affected by the borehole environment and formation characteristics, such as lithology and salinity. 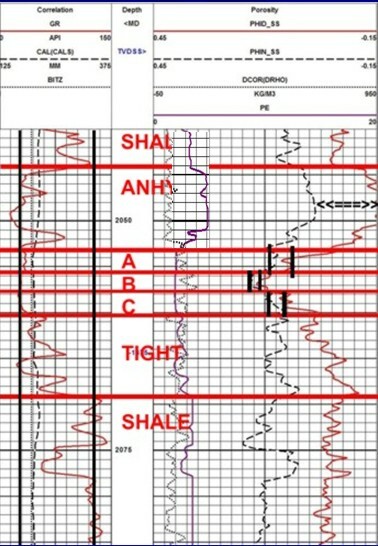 Five detectors provide information for porosity evaluation, gas detection, and shale evaluation with improved vertical resolution and borehole correction. The tool is usually combined with a litho-density photoelectric logging tool and a natural gamma ray spectrometry tool. Log curves produced are similar to the CNL. (solid curve). All have gamma ray in Track 1 with caliper for SNP and CNL-FDC displays. 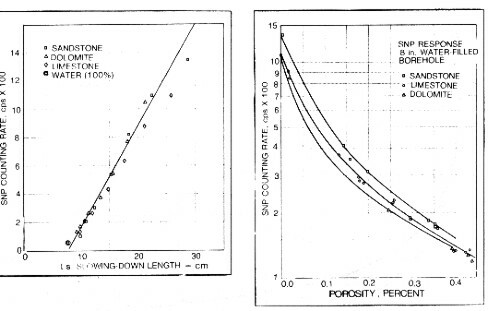 Typical display format for PE-density porosity-neutron porosity log on a sandstone scale. The density correction curve may appear on the left or right side of the wide track. A density scale of 1.65 to 2.65 gm/cc may be used instead of the density porosity scale.